From your home base at this truly lovely B&B you can experience Traverse City's wonderful wineries and brewpubs, biking, boating, dining and beaches. Explore distilleries and dunes, trails and tall ships. See you soon! Hello from Melinda & David -- your resident innkeepers! Our focus is on making you feel right at home, right away. Relax in your romantic private room and bathroom. Savor an innovative, abundant breakfast each morning. We proudly prepare and serve delicious food using locally sourced goods. Heather Room on the second floor with queen bed, large detached & tiled bathroom with soaker tub. Thistle Room also on the second floor, has new king bed, detached bathroom with rainwater showerhead & large skylight. Celtic Garden Room on the first floor has queen bed, en suite bathroom. Access to private walled garden with bubbling fountain and vintage furniture. So, who stays at Aberdeen Stone Cottage? 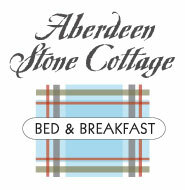 The B+B experience at Aberdeen Stone Cottage is sought after by just about every kind of tourist and traveler!